The Institute of Christ the King celebrates the classical Roman Liturgy, the “Latin Mass,” in its traditional form according to the liturgical books promulgated in 1962 by Blessed Pope John XXIII. 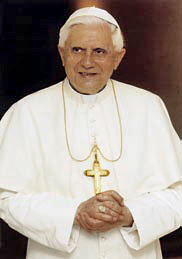 During his pontificate, Pope John Paul II exhorted bishops to be generous in allowing its use. It was with his blessing that the Institute began to celebrate the Traditional Mass. Pope Benedict XVI also wishes that the treasure of the traditional Roman liturgy, which was celebrated without change for centuries and centuries, should be preserved for all generations. Following the steps of Pope John Paul II, Pope Benedict XVI, with his milestone document “Summorum Pontificum,” restored to priests the freedom to celebrate the “extraordinary form” of the Roman rite. The Traditional Latin Mass was the exclusive form celebrated during the Second Vatican Council. As a matter of fact, most of the changes that have been introduced by the 1960’s liturgical reform took place in the years after the Second Vatican Council. The Council itself never abolished the traditional liturgy, and its famous document about the Liturgy of the Church, “Sacrosanctum Concillium,” mentions only the possibility of some adaptations but never called for the change of language nor the rite of the Holy Mass as a whole. It is, therefore, very desirable that all the faithful should know the traditional liturgy and should be able to understand its significance and its importance for the future of Holy Mother Church. More and more young people, who have never before experienced the profoundness and beauty of the traditional liturgy, are deeply touched by their first contact with it and are everywhere requesting its wider use. 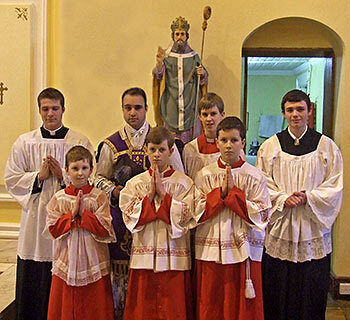 It is very convincing to see how the apostolates of the Institute, as well as those of other communities where the Traditional Mass is celebrated, are frequented by young families and youth. All of them are attracted by the force of tradition itself. It is the Institute’s aim to give as many people as possible the opportunity to know the classical Roman Liturgy because the people have the experience that it strengthens their faith, it helps them in their struggle for a Christian life in the world of today, and it always attaches them more to the Church and to the Holy Father. The founder of the Institute of Christ the King, Monsignor Gilles Wach, STD, frequently underlines that the Holy Sacrifice of the Mass is like a diamond that needs a dignified, beautiful setting to show even more its value and brilliance. For this reason, the Institute strives to surround the Holy Sacrifice with the perfectly traditional Catholic teaching and the utmost beauty and solemnity of the rite. Truth, liturgy, and charity should form an ever-greater harmony to render evident the sacramental power and riches of grace present in the Holy Mass. We try to integrate all of these elements everywhere so that the celebration of the Traditional Liturgy becomes the highlight and the climax of what our priests and faithful are living in their commitment to their Roman Catholic faith. The moment of Consecration, where the mystery of Transubstantiation takes place, is like a peak of a majestic mountain from which the streams of Paradise flow down into our daily life. Certainly, one has to come down from this peak, but the water of Divine Grace that has touched him in this moment will refresh the mind and body during the day. Our relationship with God is profoundly linked to the presence of our Savior in the Holy Eucharist, made possible through the Holy Mass and received with awe during Communion. In a human relationship, every word, every gesture, and every detail is important — how much more in our relationship with God! Therefore, to secure this relationship, on which our life and salvation is depending, the Church has always taken the greatest care with the words, gestures, and details of the Sacred Liturgy. No one would like to jeopardize his contact with the Almighty by the casual behavior or the gratuitous and willful change of words and gestures that establish, according to God’s will, this relationship. On the contrary, God Himself, by the power of the Holy Ghost, has instituted the Holy Eucharist in such a way that, even after 2000 years, we can be sure of His Divine Presence if we do what the Church does and has always done. The Liturgy, under the influence of the Holy Ghost, has developed such words, gestures, and details that God Himself has esteemed worthy to express the right kind of worship that is due to Him. No individual has permission to change these rubrics and formulas at will. 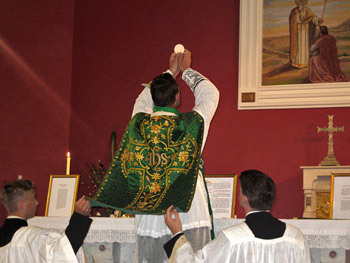 The more we are faithful to the liturgy that has grown under the influence of God’s Almighty Spirit for centuries and celebrated by the Church for much more than a thousand years, the more we will become faithful to the Church itself and worship with Her the presence of the Holy One whose glory is our redemption. The priests of our Institute are very aware of the fact that the rubrics of the Mass, born from the grace of the Holy Ghost, are to be observed with loving care if we want to maintain the treasure of the Catholic Faith. The famous sentence stating that “the law of prayer is the law of the faith” (lex orandi, lex credendi) gives to the exact and careful celebration of the liturgy great importance. He who changes words or gestures of the Liturgy endangers the faith of those for whom he celebrates and becomes responsible for diminishing the integrity of their belief. Not only the ceremony in itself with its beautiful rubrics, the dignified Latin language, and the profound expression of theological truth is important, but other details matter when it comes to making every single person understand how important the liturgy is for our lives. The vestments, the altar cloths, the candlesticks, the cruets, the garments of the servers — all of these and many other items used during the celebration of the Holy Sacrifice of the Mass have to show that we care to give the Lord only the most beautiful things that we have. For this reason, Christian art at its best plays a significant role in the liturgical mysteries. The Lord has left us the Holy Liturgy to make sure that we can remain in contact with Him. It has been the aim of the Church to bring as many people as possible to the liturgical celebration of the Sacrifice of the Lord. As a matter of fact, we could say that the only aim of the Church is to bring people in contact with the Lord through the celebration of the Sacraments, especially through the Holy Mass. It is the center of the Church, and at the same time, Her nourishment, Her protection, and Her goal because therein is the Lord. What could we do more than to strive with all our forces to make it clear to every single person that without the assistance at this holy celebration it remains very difficult, if not impossible, to stay with the Lord. Therefore, the Institute of Christ the King lives for the Liturgy, which is the source of everything else when it comes to the Faith. Liturgical matters are not minor details, but they are and they have always been one of the main preoccupations of Holy Mother Church. If not for the Liturgy, many people would not know about the doctrine, and if not for the Liturgy many people would never have met the Lord. It is a worthy task and a highly important aim to maintain the fullness of the liturgical tradition to safeguard the meaning of its mystical gestures and to defend the right to do today what the Church has always done. In total obedience to Holy Mother Church, the Institute of Christ the King is proud and happy to serve the Lord present in the Holy Mysteries of the Liturgy and to give all the energy of its members to this decisive liturgical apostolate.